Why vaccinate adults against pneumococcal disease? Pneumococcal disease is a very serious infection that causes pneumonia, meningitis, and bloodstream infection (sepsis). It is estimated that about one million US adults get pneumococcal pneumonia each year, as many as 400,000 hospitalizations from pneumococcal pneumonia occur annually in the US, and about 5-7% of those who are hospitalized from it will die. The death rate is even higher in those age 65 years and older. Fewer people will get pneumococcal meningitis or bloodstream infection, but the mortality rate for these infections is higher (10 percent or more). In the US, pneumococcal pneumonia, meningitis, and bloodstream infections kill tens of thousands each year. Pneumococcal disease can cause serious illness and lifelong complications. 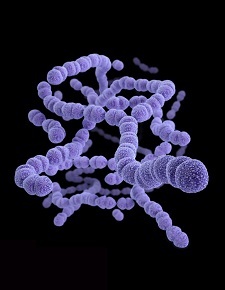 Pneumococcal meningitis can cause hearing loss, seizures, blindness, and paralysis. Serious heart problems are common among patients hospitalized with pneumococcal pneumonia. In its worst forms, pneumococcal disease kills one in every four to five adults over the age of 65 who contract the disease. Which adults need pneumococcal vaccination? There are two types of pneumococcal vaccine recommended for adults: a pneumococcal conjugate vaccine (PCV13) and a pneumococcal polysaccharide vaccine (PPSV23). *PCV13 and PPSV23 cannot be given at the same visit. Your healthcare professional can tell you which vaccines you need and the timing that is right for you. †A second PPSV23 vaccine is recommended for these persons five years after the first PPSV23. These individuals should receive a dose of PCV13 when they reach age 65 and should consult with their healthcare provider. pneumococcal disease can cause meningitis, pneumonia, or a bloodstream infection? What happens when someone gets pneumococcal disease? Pneumococcal disease can cause pneumonia, meningitis, or bloodstream infection. People with pneumococcal disease may have a combination of high fever, chills, cough, shortness of breath, chest pain, stiff neck, disorientation, and sensitivity to light. Why is pneumococcal vaccine important? Pneumococcal disease is a potentially deadly infection that can come on very quickly. Getting vaccinated is the best way to protect against this infection. Health officials updated pneumococcal vaccine recommendations in 2013 and 2014, so even people who have been vaccinated before are urged to check with their healthcare professional to see if they need an additional vaccination to stay protected. FAQ: Can I get the influenza and pneumococcal vaccines at the same time? Yes. Influenza and one pneumococcal vaccine can be given at the same time, but in different arms. In fact, pneumococcal disease can be a complication of influenza, so getting both vaccines is a smart choice. If you need a second pneumococcal vaccine, your healthcare professional will tell you when to come back for it.